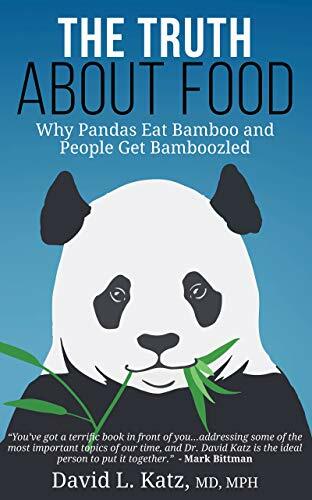 This article is from an interesting interview with Dr. David Katz, author of The Truth About Food. Dr. Katz is the founding director of Yale University’s Yale-Griffin Prevention Research Center. He reveals his “3 Truths” to end all confusion about a healthy diet. TRUTH #1: One thing I wanted to make clear is that there is no confusion among experts. People argue over the details but miss the big picture. Some might get differing advice from their doctor or their trainer or their friend over social media, but you shouldn’t rely on one person’s opinion. The world’s foremost experts are in agreement. The True Health Initiative is a coalition of world-renowned and diverse experts who have come together and agreed on the simple and actionable fundamental truths about diet and health. These experts are the who’s who in science and nutrition—leaders in the public health space, three former Surgeon Generals, the former Chair of Nutrition at the Harvard School of Public Health, the former director of the Cleveland Clinic, and so on. If your doctor was going to a conference to learn about nutrition science, these are the people that he or she would learn from. BZ: What is the biggest takeaway you want readers to get from the book? DK: The book is 780 pages because I don’t want to just tell the readers what I know. I want to immunize readers not just from today’s fad diet, but also from tomorrow’s fad diet. By showing them how to differentiate truth from lies, I’m empowering people to be able to tell what is or is not reliable information. I also wrote it as a resource for public and professional colleagues. Until we have better nutrition education in medical schools (currently there is little to none), we need to help practitioners have the best information too. BZ: Your article with Mark Bittman in New York magazine got a lot of people talking. How did that come about? DK: It’s hard to pick because my wife’s a spectacular cook. She was born in North Africa and raised in Southern France, so cooks incredible Mediterranean dishes. I love her Moroccan tagine and her vegetarian chili. You can find the Katz family’s favorite meals on her website. DK: It’s not often, but when I’m in Paris, a great crusty bread, a glass of fine red wine, and some fine goat cheese is my meal for absolutely gustatory pleasure. But I don’t like or crave junk. When I indulge, it’s rare and not on fast food. DK: I’m most proud of trying so hard for so long to disseminate the fundamental truths that can add years to lives and lives to years. It’s hard. If you’re out there, you get attacked. I have a pack of trolls and it gets worse and worse every year. I started this path a couple decades ago, and made it my mission to reduce chronic disease. Now we have more chronic disease than ever. I have a wife and children. I know what it means to love other people and want them to have the best possible destiny. So it’s mission critical and I don’t plan on giving up. I’m soldiering on. David L. Katz, MD, MPH, FACPM, FACP, FACLM earned his BA from Dartmouth College; his MD from the Albert Einstein College of Medicine; and his MPH from the Yale University School of Public Health. He completed sequential residency training in Internal Medicine, and Preventive Medicine/ Public Health and is board certified in both disciplines. He is also author of roughly 200 scientific articles and textbook chapters, and 15 books to date, including multiple editions of leading textbooks in preventive medicine, nutrition, epidemiology, and biostatistics.